79% of Americans agree they would benefit from having basic financial education and information. Welcome to our research center! We've put together a library of information on important financial topics that we believe you'll find helpful. Simply click on one of the general financial topics below and you'll find a selection of easy-to-understand information sheets about related financial concepts and strategies. This information is updated regularly to reflect the latest facts, figures, legislation, and economic trends. A living trust can help control the distribution of your estate upon death. To retain the tax advantages associated with charitable giving, your gift must be made to a qualified organization. If you haven’t taken steps already, consider planning now for the distribution of your estate’s assets. An A-B trust can be an effective way to help reduce estate taxes and preserve family assets for heirs. Compare the advantages and disadvantages of different gifting strategies available for planned giving. Charitable lead trusts are designed for people who would like to benefit a charity now rather than later. A designated income beneficiary could receive payment of a specified amount from a charitable remainder trust. A wealth replacement trust could be used to gift appreciated assets to a charity as well as provide for heirs. A SEP IRA is a type of plan under which the employer contributes (up to a certain limit) to an employee’s IRA. The SIMPLE plan may appeal to small business owners as it is easy to set up, administer, and allows for a tax deduction. A “stretch” or “multigenerational” IRA may be a useful approach to extend tax-deferred savings that can benefit your heirs for generations. If you leave a job or retire, you should consider your options regarding your employer retirement plan assets. A Roth 401(k) is funded with after-tax money, and allows for tax- and penalty-free withdrawal of earnings if requirements are met. Profit-sharing plans give employees a share in the profits of a company and can help to fund their retirements. A money purchase plan is a retirement plan where employer contributions are based on a fixed percentage of compensation. A 403(b) plan is a tax-deferred retirement savings plan that can only be offered by a 501(c)(3) tax-exempt entity. Annuities, an insurance-based financial vehicle, can provide many benefits that retirement investors might want. A split-annuity strategy can generate immediate income while potentially stretching some retirement savings. Living benefits can help protect variable annuity owners from running out of money in retirement. How Much Do I Need to Save? Many realize it’s important to save for retirement, but knowing exactly how much to save is another issue altogether. With the changing pension landscape, it is important to take charge of your own retirement security. A Section 1035 exchange is a tax-free exchange of an existing annuity contract or life insurance policy for a new one. There are key dates after you turn 59 that can impact your taxes, Medicare eligibility, and retirement benefits. Allocating too much of your retirement investments to one company, even your own, can be a risky proposition. There are a variety of retirement planning options that could help meet your needs. Here are some of the most popular. The Social Security Administration’s retirement estimator gives estimates of your future benefits based on your actual Social Security earnings record. Tax-deferred retirement plans for self-employed individuals have higher contribution limits than IRAs. When receiving money accumulated in your employer-sponsored retirement plan, you have two options: lump sum or annuity. If you do not participate in an employer-sponsored retirement plan, you might consider a traditional IRA. 401(k) employer-sponsored retirement plans have many benefits, including that the funds accumulate tax-deferred. Employer-sponsored retirement plans are more important than ever, but managing the assets can be confusing. If you start saving for retirement sooner, the more money you are likely to accumulate and possibly retire sooner. Qualified Roth IRA distributions in retirement are free of federal income tax and aren’t included in gross income. Capital gains are profits realized from the sale of assets; a tax is triggered only when an asset is sold, not held. Everything you own, whatever the form of ownership, is subject to federal, and possibly state, estate taxes. The federal gift tax applies to gifts of property or money while the donor is living. IRAs and employer-sponsored retirement plans are subject to annual contribution limits set by the federal government. Required minimum distribution is the annual amount that must be withdrawn from a qualified retirement plan/account. For the grantor, there are a few potential tax benefits that can come with setting up a charitable trust. With traditional IRAs and most employer-sponsored retirement plans, taxes are not payable until funds are withdrawn. Tax-deferred retirement account withdrawals before age 59½ generally triggers a 10% federal income tax penalty. There can be a substantial benefit to deferring taxes as long as possible. Many traditional tax-advantaged investment strategies have gone away, but there are still some alternatives. While stable, CDs can create quite an income tax bill. Fixed annuities and municipal bonds can offer tax advantages. Want to keep more of your mutual fund profits? You may be interested in strategies to help lower your tax liability. It is important to understand how dividends (taxable payments to shareholders) fit with your long-term goals. ETFs have unique attributes and attempt to track all types of indexes, industries, or commodities. The labels “growth” and “value” reflect different approaches that can be used when making investment decisions. Mutual fund taxes can be cumbersome, but there are ways to help mitigate the amount of taxes you may owe. Before investing in stocks, it is important to understand some of the basics and the risks involved in owning stocks. Zero-coupon bonds represent a type of bond that does not pay interest during the life of the bond. An important element to successful investing is to manage investment risk while maintaining the potential for growth. Bonds are issued by many entities and share many characteristics, each type of bond has certain benefits and risks. A bond is simply evidence of a debt from a government entity or a corporation and represents a long-term IOU. Stock market indexes can be useful benchmarks for gauging the performance of an investment portfolio over time. The difference between purchasing an individual stock versus shares in a mutual fund to potentially earn dividends. A mutual fund is a collection of stocks, bonds, and other securities with certain benefits and risks. With closed-end funds, investors pool their money together to purchase a professionally managed portfolio of stocks and/or bonds. It’s important to understand mutual fund loads, or sales charges, and exactly what they entail so you can make informed investing decisions. An annuity is a flexible financial vehicle that can help protect against the risk of living a long time because it provides an option for a lifetime income. Both fixed and variable annuities could be appropriate options for an individual interested in purchasing an annuity. Understanding different types of investment risk can help investors manage their money more effectively. There are five broad asset classes that you should take into consideration when constructing your investment portfolio. Asset allocation is a method used to help manage investment risk; it does not guarantee a profit or protect against investment loss. There are other ways to invest in stocks and bonds besides owning individual shares or bonds. Dollar-cost averaging involves investing a set amount of money on a regular basis, regardless of market conditions. 529 plans are tax-advantaged college savings plans that generally allow people of any income level to contribute. A sound cash management program uses a disciplined approach: accounting, analysis, allocation, and adjustment. Before making investment decisions, it is helpful to determine the real rate of return on the investment. Short-term cash management instruments can help you establish a sound cash management program. Money market funds can be a highly liquid and effective cash management tool. There are numerous investment alternatives available to help provide liquidity. Here are some smart ways to refinance your home. There are a number of savings alternatives that could help you earn a reasonable rate of return. Historically, one of the best ways to fight the effects of inflation has been to utilize growth-oriented investments. If you have a family who relies on your income, it is important to have life insurance protection. An annuity is a contract between you and an insurance company to pay you future income in exchange for premiums you pay. Property and casualty insurance can help protect a variety of assets. Find out what it does and doesn’t cover. A business owner policy is an insurance package that assembles the basic coverages required by a business owner in one bundle. Company-owned life insurance is one way to help protect a business from financial problems caused by the death of a key employee. Split-dollar life insurance is an arrangement to purchase and fund life insurance between two parties. Couples who want to help protect their legacy from estate taxes could consider last-survivor life insurance. As a business owner, a disability can create an economic hardship putting both your personal finances and business at risk. Term life insurance differs from permanent forms of life insurance in that it offers temporary protection. Some of the pros and cons of whole life insurance. Consider a universal life insurance policy if you want the flexibility to change your premium or death benefit. Variable life insurance gives you the control to allocate your account value among a variety of investment options. When it is time to make an insurance claim, it helps if you are familiar with your policies and the steps you should take to file a claim. Several factors could undermine the financial security provided by the proceeds of your life insurance policy. To help you choose insurance wisely, determine how much coverage and what kind of policy is best for your situation. Knowing the basics of a disability income insurance policy is a good first step toward protecting your family. Consider additional liability insurance to help protect you from the potentially devastating effects of liability lawsuits. Using a financially sound insurance company is an important part of ensuring your family’s financial security. When selecting a life insurance policy, examine all your options, as well as the positives and negatives of each type. 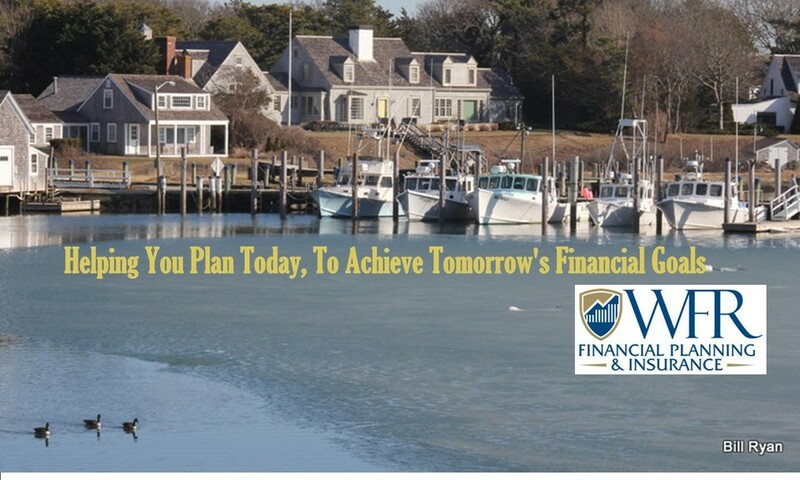 WFR Financial Planning & Insurance is independent of John Hancock and Signator Investors, Inc. Member FINRA, SIPC, a Registered Investment Advisor. Arkansas, California, Connecticut, Delaware, Florida, Kentucky, Massachusetts, Maine, New Hampshire, New York, Pennsylvania, Rhode Island. Arkansas, Delaware, Florida, Massachusetts, Maryland, Maine, Missouri, North Carolina, North Dakota, New Hampshire, New Jersey, New York, Ohio, Pennsylvania, Rhode Island, Tennessee, Texas, Virginia, West Virginia.